In browsing Facebook today, I came across an interesting article in relation to the recent Universal release Lucy. The article asserts that the film is a prime example of what is wrong with Hollywood…whitewashing of casting options. While I think this may be a little unfair to single out this film, there were some interesting points and it does spotlight this challenge with Hollywood…diversity. Focusing on Lucy first, the casting of Scarlett Johansson to play the lead character in itself is not really a problem. The reality is that she has been accepting a lot of roles recently that take emotion out of the requirements for her on-screen presence, and she seems to revel in it. She also seems to be taking on this somewhat action oriented roles, with The Avengers, Captain America, and Iron Man included in that list. Why should this be a problem? In the context with the rest of the film, there are a few challenges. Lucy is considered the oldest discovered hominid from Ethiopia. Being that she was discovered in Africa, why was she appearing in the film as living in more of a temperate climate amongst a North American-like landscape. While the location was never specifically stated, it seemed odd that the film’s depiction of hominid Lucy was not in Ethiopia. The have Scarlett’s character named after this hominid then seems out of place but not necessarily a problem. The article also talks about Hercules, which is just one in a long line of films to take African and Middle Eastern representations but have white actors portraying the characters. There cannot be a shortage of possible actors out there of African and Middle Eastern descent to fill these roles. Dwayne Johnson in Hercules is fine, but the lack of represented diversity in the rest of the cast is wrong. Prince of Persia ended up starting Jake Gyllenhaal and a cast of a similar lack of diversity to Hercules. Another strong example is The Last Airbender. Besides the film being a poor adaptation of the story, the cast was mostly white when the populations should have been from more Asian descent. Title characters have encountered this treatment for years. John Wayne played Genghis Khan in The Conqueror. Rob Schneider played an Asian/Canadian minister in I Now Pronounce You Chuck & Larry. And while the film was supposed to be offensive to the point of somewhat making a statement, Robert Downey Jr. dressed up in blackface to play one of the leading characters in Tropic Thunder. Added to this issue with misrepresentation of characters through casting, actual diversity in film seems to lack attention to quality opportunities for actors/actresses of color. There are some successful films that have diversity represented well, but the overall issue is that many great films are passed over and outproduced by the Hollywood standard. There have been some strides in film. In the last 15 years, there are four people of color who have won either Best Actor or Actress (Halle Berry in Monster’s Ball, Denzel Washington in Training Day, Jamie Foxx in Ray, and Forest Whitaker in The Last King of Scotland). During that same time, there have been five winners in the Supporting Actor and Actress categories (Morgan Freeman in Million Dollar Baby, Jennifer Hudson in Dreamgirls, Mo’Nique in Precious, Octavia Spencer in The Help, and Lupita Nyong’o in 12 Years a Slave). Steve McQueen became the first producer to win for Best Picture with 12 Years a Slave in 2013. 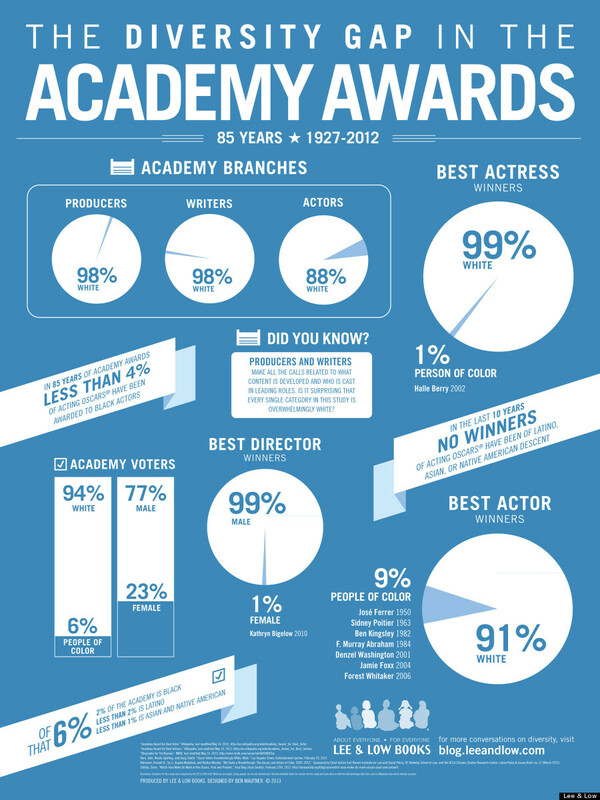 Though the graphic above depicts this information in a more negative light, it does also represent the entire history of the Academy Awards as opposed to more recent successes. There has been a slightly more significant amount of representation in the nominees and winners. Unfortunately, there are few other populations that can talk about even the success that the Black community has experienced. In the Asian community, only Ang Lee can represent recent success in major Academy categories for his work with Brokeback Mountain and Life of Pi. The Hispanic community in nominations and winners is nearly nonexistent. The graphic above also goes more in depth with actual representation of the voting members. I am not saying that Hollywood needs a complete overhaul, but it does need to take a long look at how it promotes growth and representation. We as consumers should be more interested in seeing more diversity, even if it is to get more variety in our films and storytelling. Talent is out there and we need to embrace it. Tyler Perry does not represent the only diversity that can grab attention at the box office, even if he has broken some ground for consistent box office success. Of this year’s films, new talent is emerging. Tony Revolori from The Grand Budapest Hotel showed off his quirky, comedic, and touching acting talents. The Raid 2 is an action-packed thrill-fest that is of much better quality than many of the action films that are still to come out this year, including The Expendables 3. Ken Wantabe continues to get more roles to provide better exposure for what he can do. Let me know what you think…do you believe it is time to embrace more diversity in film?